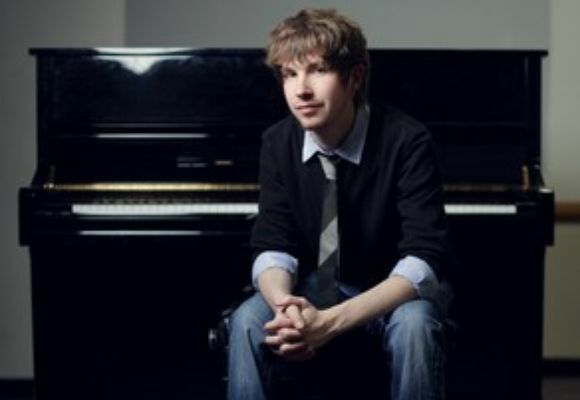 Born into a musical family, New York-based pianist and composer Julian Waterfall Pollack started studying piano at age 5 with his mother, a concert pianist. He started leading his own groups as an early teenager, and by the age of 17, he signed with Jazzschool Records, which released his highly acclaimed debut album. Pollack has been recognized by critics around the world for his elegant touch and maturity, and for his singular blend of jazz improvisation and composition that combines a love for today's popular music as well as a respect for the tradition of classical music. The past few years have been very exciting for the 23-year old Northern California native. After the release of his second album, Infinite Playground (Junebeat Records, 2010), San Francisco Chronicle Music critic David Wiegand wrote that the new album "provides ample evidence that Pollack is a ferociously assured and creatively dazzling pianist, composer and arranger." During a primetime NPR interview, Wiegand stated, "You often hear young people who are really, really talented; what you don't hear--that I hear in Julian's music--is maturity and soul and a lot of thoughtfulness." Infinite Playground received a five star rating from the San Francisco Chronicle and has been garnered much critical acclaim from other publications and critics across the globe. Pollack was recently commissioned by the French Will Never Forget (TFWNF) to compose and arrange for piano and the Academie de Musique Symphony orchestra for the largest September 11th ten-year commemoration in the world outside of NYC, which took place in front of the Eiffel Tower, at the Place du Trocadero in Paris. He was also featured in the 2011 film "In Good Time," a documentary about the life and music of Marian McPartland, host of NPR's award-winning program Piano Jazz (on which Pollack first appeared as an 18-year old). Last January, Pollack was appointed Artistic Director of the Jazz Series at the Mendocino Music Festival in California. In June, Pollack was awarded an ASCAP Jazz Composers award for his composition "Blackberry," from his album Infinite Playground. Pollack has performed numerous times at the Blue Note in New York City under his own name, and opened for artists such as Chick Corea and Gary Burton. He also has performed and or recorded with the likes of Joshua Redman, John Scofield, Miguel Zenon, George Garzone, Ari Hoenig, Christopher Tordini, Taylor Eigsti, Nir Felder, Ambrose Akinmusire, Billy Buss, Chase Baird, among others. Pollack has performed at many prestigious venues such as the Village Vanguard, Dizzy’s Club Coca-Cola, The Jazz Gallery, Smalls Jazz Club, Yoshi’s, The A-Trane, Lincoln Center, The Kennedy Center, and international festivals including Montreux, Umbria, Earshot, Salt Lake City, and Monterey. Pollack is also the recipient of the prestigious Level One Gold Prize awarded by the National Foundation for the Advancement of the Arts (NFAA) and was a member of its Clifford Brown/Stan Getz All-Stars. After the release of Pollack's first album, Goin’ For It, internationally acclaimed JAZZIZ Magazine selected the high-octane original, "Take Me Outside," to be on its monthly CD series, JAZZIZ On Disc. As a 17-year-old, he was featured in the NFAA's Academy Award nominated documentary, "Rehearsing a Dream" which has appeared and continues to appear on HBO. Over the years, Pollack has worked steadily as a concert pianist, performing in contemporary chamber ensembles and as a soloist. In 2010, he performed John Adam's "Hallelujah Junction" for two pianos with Susan Waterfall at the Mendocino Music Festival (which the composer attended), as well as George Crumb's "Music For A Summer Evening." In 2011, he performed Steve Reich's "8 Lines" with the Mendocino Music Festival Chamber Music Players under the direction of San Francisco's new music ensemble Earplay conductor Mary Chun. Past years at the MMF have found Pollack performing solo works by Schoenberg and arranging music for the critically acclaimed nationally touring show "They Left A Light," featuring music written by Jewish prisoners of the World War II Nazi concentration camps. As a dedicated player in the Berkeley High Jazz Ensemble and Combos from 2002-2006, Pollack was awarded a full-scholarship to Berklee College of Music in Boston. Deciding instead to move to New York City, he attended New York University, earning a degree in piano performance and composition. While in college, Pollack's trio was selected by Brad Mehldau and Carnegie Hall to work with Mehldau through a special workshop at Le Poisson Rouge in New York City. Presently, Pollack is an instructor of jazz piano studies at New York University. This year finds Pollack working on a concerto for piano and orchestra, commissioned by the Camellia Symphony Orchestra in Sacramento. The concerto will be premiered by the Camellia Symphony Orchestra in February of 2012, with a repeat performance at the Mendocino Music Festival in July of 2012, both times with Pollack at the piano.